Writing this now in August, the exact timing of the things I did is a little hazy but I think this is day eight, and whatever number it is, it’s front wall day. 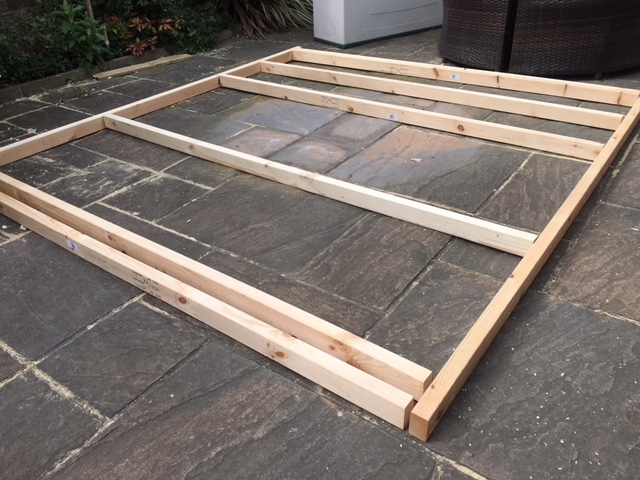 Building a stud wall with a door and a window in it is another level of complexity but with some planning and following the guidelines for stud wall construction is still basically straight forward. In a nutshell doors and windows need to be framed with additional studs and have a thick header above them to hold the weight of the roof without putting downward pressure on the door or window. Windows have short studs, called “cripple studs”, below them. Laying out the studs. Holes have all been drilled through the base and header timbers in advance. This is a useful photo. I’m working on a patio which isn’t flat (the patio now being free of the previous pile of wood). 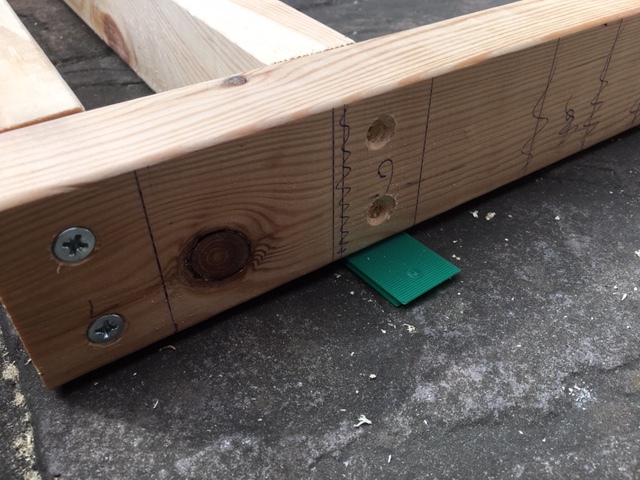 Because of this the studs would often be a bit misaligned from the header or base timbers. I used 1mm glazing packers to make sure they were aligned before screwing the studs in place. The studwork below the window is done. The studs that the door header will sit on are also in place. The studwork without OSB or cladding is still heavy but manageable for one, so I raised the wall and screwed it to the floor and side walls. 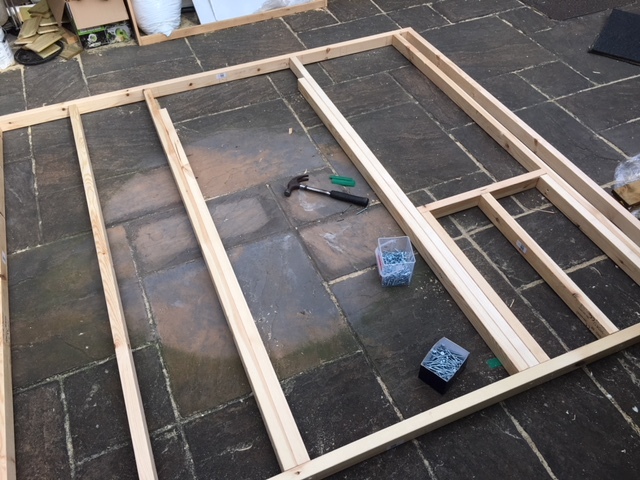 The headers above the door and window are two lengths of timber screwed together – in this photo I have yet to attach the second piece and the cripple stud above the door opening. The weather has turned at this point with a couple of light showers meaning I’m using a small tarp to vaguely cover the shed. 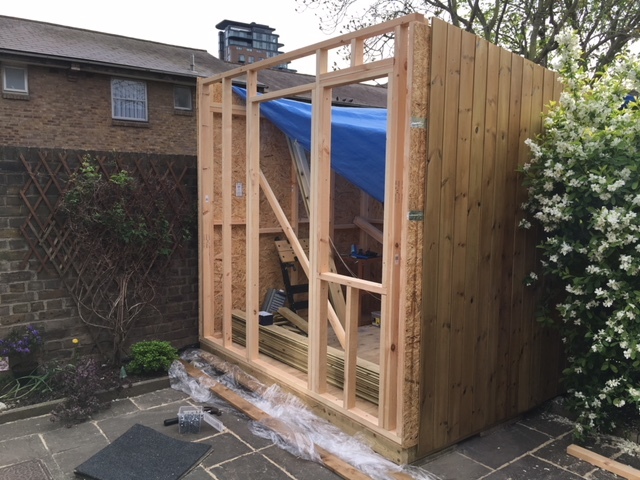 All this leant a real sense of urgency to properly weather proofing the shed but I had now run out of days off work so I used the big tarp that was covering the pile of timber to completely cover the shed and waited for the next weekend to put on the roof and install the doors and windows.